Rome, Italy, 13 August 2018: The ECOC Exhibition 2018 has revealed the names of the companies that will feature at this year’s Market Focus, with some of the technology industry’s biggest names among the line-up. Sponsored by Inphi, the 29-strong Market Focus agenda will feature the likes of Facebook, Microsoft, BT, Ovum, NTT, Cisco, China Mobile, Huawei and Telefonica, among others, all of which have successfully submitted papers exclusively for the 2018 Rome audience. The three-day series of presentations is a key part of the ECOC Exhibition with topics ranging from FTTX evolution and next-generation data centres to optics as an enabler for 5G. A focus on ‘Data Centres: Optics in Cloud Computing’ will kick-off this year’s Day 1 agenda with Inphi the first of six speakers which also include Facebook, II-VI Inc., Consortium for On-Board Optics (COBO), Arista Networks and Luxtera. The afternoon’s session on ‘Fibre Access’ will follow, featuring the FTTH Council, Corning, Source Photonics and Ericsson. The final day will be dedicated to the subject of ‘Service and Content Provider Optical Transmission,’ with Ovum, BT, Finisar, ADVA Optical Networking, Cisco, Huawei, NTT, China Mobile and CESNET all confirmed as participating. This year’s topics have been independently selected by the ECOC Exhibition Advisory Committee which includes globally respected representatives from all aspects of the optical communications industry. 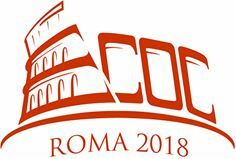 The ECOC Exhibition will take place from 24-26 September 2018 at the Fiera Roma in Rome, Italy. If you are interested in attending, please visit: https://nexus.circdata-solutions.co.uk/RFG/publish/ECOC18/. The ECOC Exhibition is the largest optical communications exhibition in Europe, held each September in a different European city, the event is the key meeting place for decision makers from across the fibre optic communications technology industry. Now in its 23rd year, the exhibition now attracts over 5,000 decision makers from all around the world – bringing together manufacturers, suppliers and service providers to networking, gain insights on the latest developments, new products and trends in the industry. ← The true cost of SIP downtime; what is the impact to your business?